Samsung Electronics Australia has launched an ad campaign for the Galaxy Note II that makes use of NFC. The campaign, created by Australian digital agency Amnesia Razorfish, showcases work created by up-and-coming artists on the Galaxy Note II. 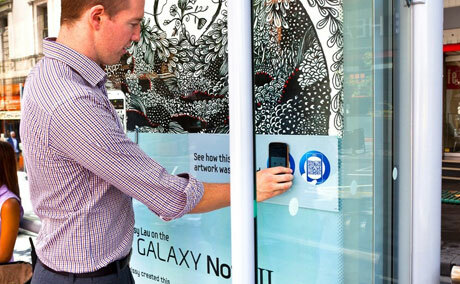 An outdoor advertising campaign, booked with out-of-home media owner Adshel, encourages people to read an NFC tag or QR code placed on the ad to get a behind the scenes look at the creation of the artwork shown on the poster by downloading video content from the Samsung Australia YouTube channel. “Samsung devices are some of the only phones in the market with in-built NFC technology so we are able to utilise a host of innovative features in this campaign, particularly with the outdoor component,” says Ben Hourahine, head of strategy at Amnesia Razorfish. “The aim is to drive trial of the product no matter where you are. One of the barriers we needed to overcome was that, until now, the Galaxy Note II could only be experienced in-store,” he added. “So we decided to flip the problem. Rather than working to bring people in-store, we wanted to emulate the experience across environments. Basically allow people to try the Note II wherever they are”. The campaign will run until the end of March. iPhone 5S to include NFC and fingerprint security?